Yes, we’ve become a nation of sushi-lovers. But are we Americans really in tune with the Japanese aesthetic that undergirds the sushi bar? It’s worth asking…because the more you know about what the Japanese are thinking…the more fun it is to enjoy Japanese food! 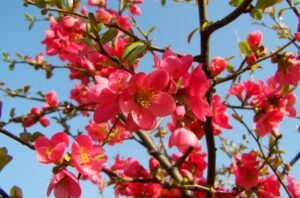 There are five general precepts to ponder. #1: Relationship to Nature. Sure, sure, every chef everywhere these days goes on about how “natural” his food is. I recently told the story in my e-zine of the self-proclaimed “natural” Hungarian chef in Pittsburgh—whose kitchen, I found, is loaded with industrial supplies. Not very natural at all, I’m afraid. But even when non-Japanese chefs take this “natural” stuff seriously—they do not, repeat, do not, take it anywhere near as seriously as Japanese chefs do. I suppose the sushi aesthetic is the best way to describe this. One of Japan’s greatest cooking teachers, Shizuo Tsuji, in his early, brilliant stab at communicating the essence of Japanese food to Americans—Japanese Cooking: A Simple Art, first published by Kodansha in 1980, and recently re-published as a “25th Anniversary Edition”—tried to prepare a pre-Nobu, non-sushi eating American public for the type of food at the heart of his national cuisine. He called the consumption of sushi “barbaric”—in the most positive sense! Twenty-five years later, with Americans eating sushi all over America—and eating it with great frequency and relish—we still don’t see it this way. We would recoil from the idea of barbarism. But to the Japanese culinary mind, barbarism is key; it is very important, in the authentic Japanese appreciation of sushi, to imagine a living thing scooped out of the water, its life slashed away immediately by knives, its vital spirit still throbbing through the now-manicured flesh that appears on your plate. Why? Because Japanese chefs try to get the diner as close to nature as possible. At a coastal ryokan on the Izu-Hantu peninsula, a few hours west of Tokyo, I was served a simple strawberry for dessert. It looked just like…a simple strawberry, green stem and all. It turned out to be the greatest, most perfumed large-size strawberry I’ve ever tasted…but I mention it for another extraordinary element, its “natural-ness.” As one begins to eat it, one notices that the “stem” part has a slit under it that goes about 320 degrees around the top of the berry, so that stem and clinging flesh remain attached to the strawberry. The chef had nudged the stem aside, plunged into the berry to remove the husk, then slid the stem back over the top of the strawberry so it looked “natural.” No signs of a slit were visually evident. When you saw it on your plate, despite all the work and precision it took, you had no clue that anyone had ever touched this thing—which, as I came to discover, is exactly what a great Japanese chef wants you to think. At ryokans like this, and at other top-quality Japanese restaurants, they serve the famous multi-course kaisekimeal, which has evolved from the ancient tea ceremony. Yes, it is the forerunner of the menu degustation that can be found at any important restaurant today, around the world, in any culture. But the key to the kaiseki is an obsessive seasonality which stems from the Japanese compulsion to be in tune with nature. Yeah, every chef everywhere today blabs on about seasonality—but only in the kaiseki dinner do they bring the season on to the table in the form of seasonal flowers, and in the form of tableware (!) that reinforces the mood of the season. How much further can you go in your attempt to harmonize with nature? Of course, it’s not only at the “fancy” restaurants where this aesthetic is at play. Japan is unique in all the world, I think, in its range of restaurants devoted to one ingredient only. Sure, we have steakhouses in the U.S.—but you usually can get dozens of other things as well, many not so natural, at an American steakhouse. Tokyo has “eel” houses—devoted only to simple preparations of eel, and the things that go with eel. Ditto for “crab” houses, with no Old Bay seasoning. The goal in all of these cases is to get as close to a single ingredient as possible, to banish artificiality and non-natural superfluousness. We are living creatures, living inside an ecosystem…and the Japanese view is that we need to keep reminding ourselves that we are in Nature, that we are part of it all…and that we are not some sort of supra-natural creatures dipping in to Nature for the sake of having dinner. When you cross this line in your mind, you’re eating Japanese. #2: The Sea. This is difficult to describe, in a way: I think it’s something that you must experience in Japan itself to comprehend. But the relationship of the sea to Japanese food is more fundamental, more intrinsic, than the kind of oceanic-gastronomic coordination found elsewhere. It is important to understand that what I’m talking about is not a supply issue. In Spain, for example, you might say that the long, surrounding coastline furnishes the Spanish with ample opportunities to prepare seafood—and they have risen to the challenge artistically, fashioning one of the world’s most thrilling palettes of piscatory possibilities. That’s not what we’re talking about here (though you can reach a similar conclusion in Japan, if you want). The heart of the matter in Japan is the way the seainforms the gastronomic imagination—the way the very aesthetics of the sea have been absorbed by Japanese people, and the way that marine themes are manifest, over and over again, in all of Japanese cooking. Before I spent time in Japan, I knew, of course, that it consisted of many islands. But I didn’t quite realize how long this island chain stretches: if it were turned North-South (it actually runs East-West to a surprising degree), and super-imposed on North America, with its northern tip at Montreal, its southern tip would be in Florida. I also didn’t realize how narrow the islands usually are from one side to the other, and how pervasive the feeling of “sea” is no matter which part of the country you’re in; even a central farmer looks towards the coast as he harvests his soy beans. Add one more geographic/agronomic factor to this: because of the mountainous nature of the terrain, farming, for most of Japan’s history, was not the easiest of enterprises. Therefore, many Japanese people, for many centuries, all over the country—to an extent much greater than in, say, Spain (another extraordinary seafood country)—had to rely on the sea, and the sea alone, for nourishment. The sea is everywhere, And I say that this has resulted in an “aesthetic of the sea,” even when foods other than fish are on the table. 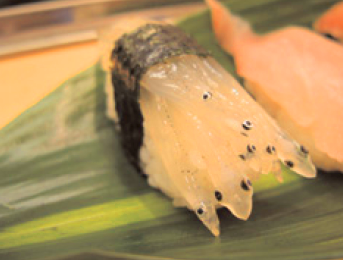 Raw “fish” is just the beginning; of course the centrality of sushi in Japanese cuisine says much about sea worship. But “raw” tells an interesting tale, as well: for only in a pre-FedEx country with dazzling immediate access to the sea could the whole trans-national notion of eating raw fish have evolved. It is true that some areas added the concept of preserving fish—but that was because their sea-savvy sense of freshness forced them to find other solutions. Today, that primitive sense of “freshness” from the sea affects all culinary thinking: because it was the freshness of fish the Japanese focused on, and because “fresh” fish does not have a long open window, the very timing wired into Japanese gastronomes became a rapid one. “Things must come out of nature and be consumed quickly,” they learned from the sea. Today, when you tour Japanese markets, and observe fruits and vegetables, for example, in conditions more pristine than those of France—with elaborate air-blocking wrappings that preserve every second of first flush—you begin to understand how the ancient sea has affected all things modern. And you begin to see how Mind-Set #1 (Nature) is so firmly fused with Mind-Set #2 (The Sea). I contend that it also the aesthetic qualities of foods from the sea that have fundamentally informed the Japanese gastronome’s table-view. There is a kind of watery cleanness and lightness about fish—a set of elements that roll through all of Japanese cooking. It can be no accident that after the Japanese learned to fry from the Portuguese they reverted to dipping their fried fish in water—after frying!—to return it to its more natural condition. If the chef doesn’t dip in the kitchen…then fried tempura may be dipped at the table, not always in just a dipping sauce…but in a bowl of broth, which completely changes the texture. We in the West would never make our fried food wet—but, in Japan, everything must return to the sea. That notion is reinforced by the ingredients of the broth in which the tempura gets dipped: dried fish and dried seaweed! Which brings us to another fascinating reality of authentic Japanese food. In the West, what would you identify as the “background noise” of our cuisine? Depends where you are, I guess. In lots of American places, it’s the ketchup that’s ubiquitous; you could argue that that changes to Tabasco in Louisiana. In the Mediterranean, I’d say olive oil is the fundamental solvent that lubricates the food. And in France—where food obsession runs neck-and-neck with Japanese food obsession—I’d call stock the everyday player in everyday cooking, particularly in traditional everyday cooking. That French stock is often made from veal bones, sometimes with other meats mixed in. The French have fish stock as well, of course—but it is only used for the preparation of fish dishes. In Japan, the traditional cuisine, and the modern cuisine, are also pervaded with stock—in this case a stock, called dashi, made chiefly from dried tuna (calledkatsuo boshi and dried kelp, a form of seaweed calledkonbu)! Amazing! And this sea-stock dashi is usedthroughout Japanese cooking! I’m looking at a recipe right now for niku jaga—simmered beef with potatoes—and it includes a cup of dashi, as do so many non-fish dishes in Japan. I’m telling you: in this country, the sea water has crept into everything! Of course those dashi ingredients tell a tale as well. Dried fish is available in manifold forms, and gets consumed in manifold ways—including as a sprinkle on non-fish dishes. Seaweed, I think, is responsible for even more thought formation in the Japanese mind. Now, those with some knowledge of Japanese food will probably leap in their thoughts to nori, a manufactured dried seaweed sheet used in so many delightful ways at the sushi bar. But as you travel through Japan you realize that nori’s not the main application of seaweed. Everywhere you go, you find some tangle of some unknown seaweed served as a kind of salad, used as a kind of garnish, tossed with vegetables, or meats, or noodles, or rice. The flavor is often sea-like, which resonates with the mind-set discussed above. HOWEVER…to me, the textures are perhaps the most important elements of all. Read on. #3: Texture. Tell the truth: the first time you ate a waxy, tooth-resistant, fairly flavorless morsel of squid at a sushi bar—did you not say “what’s up wit’ dat?” Did you not wonder why anyone would make a fuss about this? Then, if you stayed at it, the answer opened up for you: its joy is the unusual way it feels as you eat it. And that’s when you realized that texture is far, far more important to Japanese diners than it is to Western diners. My theory explaining this has once again to do with—guess what?—naturalness and the sea. In a country with land-based nutrition—let’s say France—those who have a predilection for eating things “naturally” have probably not, for centuries, imagined what it would be like to travel the earth on hands and legs, munching on brush, picking up the occasional rock in the mouth, roaring after smaller animals to rip their flesh and consume it. But now imagine a country of imaginative thinkers who have the sea as a chief culinary reference point. Thousands of years of imagining the life of the fish—and some fish have souls, in fact, in ancient myth—have led to much reflection, none of it distasteful, on the process of consuming other, smaller fish, still swimming in the water, and the parallel process of chomping on seaweed from the ocean floor, or on slimy algae growing on rocks. The end point of all this imagination, I contend, is a great fondness in Japan for things with the texture of underwater life. Over and over again, at my recent meals in Japan, I’d observe the Japanese diners relishing the slippery feel of an ingredient—the feel you might find in those rock-clinging algae—while a number of American diners would recoil, saying “Uggh! That’s slimy!” And though the aesthetic may well have begun with an appreciation of “sea texture,” it goes way beyond the sea now: the Japanese love everything slimy, from fermented soy beans called natto, to bulbous, savory, gooey dumplings that have been made from pounded glutinous rice, swimming in slightly gelatinous broth thickened with arrowroot. My observation is that the Japanese diner is on a constant prowl for texture, all kinds of textures, to an extent unknown in the West—and if the texture under consideration seems to suggest the sea, so much the better! #4: Small Is Beautiful. Another age-old reality of Japanese life has led to another basic component of the Japanese Food Mind. Agricultural plots were traditionally small in this country, with miniscule harvests—and the lone fisherman down by the sea couldn’t rely either on a large “harvest.” So the Japanese, over eons, learned to appreciate each morsel that appeared on the plate. This kind of appreciation changes everything at the table: serving rhythms are different, eating rhythms are different, the mental process of appreciation is transformed. Even in an impoverished medieval Europe, the mythology of dining had to do with large oxen roasts, endless platters, Rabelaisian portions, bottomless flagons of wine and tankards of beer. The mythology of Japanese dining stands in relation to this…as the short Japanese verse form, haiku, stands in relation to Paradise Lost, by John Milton, one of the longest and richest poems ever written. For many Westerners, this virtue-in-paucity is difficult to take. My Dad, for example, whom I finally influenced to appreciate sushi in about 1980, still didn’t get that aspect of portion control. On a Friday night, we would march into a sushi bar given three or four stars by the New York Times that day, and run the gauntlet of offerings. Then, immediately after, my Dad would insist on a “nightcap” at the Carnegie Deli for some real food. You still see vestiges of that thought process in “American” Japanese food. The whole trendy phenomenon of “giant sushi” is based, I believe, on the American inability to understand the beauty of proportionate dining. Go to a place like Yama, in New York City, and you’ll find obscenely large slabs of raw fish hanging over the sushi rice—which makes the American sushi neophytes ooh and aah. To the Japanese, however, it is a vulgar violation of tradition—and something that simply doesn’t taste as good as the classic ratio. Of course, in modern Japan there are ample opportunities to vulgarly chow down on mass quantities of food—the portions of tonkatsu, or fried pork cutlets, for example, are anything but diminutive. But this is a latter-day exception to the rule. And Westerners who don’t understand that will have a difficult time tuning into the Japanese gastronomic mind-set. #5: Intensity of Focus. Related, perhaps, to the mind-set required to appreciate a very small morsel—but related as well, surely, to the phenomenal powers of concentration required of Zen Buddhist monks—the ability of the Japanese diner to turn his or her attention to one “thing” only is legendary. A “thing” can be the one strawberry at the ryokan I described above: the world stops, as the Japanese diner focuses on every sensual aspect, and every metaphoric implication, of the food. You don’t need a group of strawberries to do this, or a highly transformed strawberry, or a combination plate of multiple fruits mingled together. All it takes is one strawberry. But another definition of “thing” is a category of food—such as grilled chicken. The Japanese notion of focus is another reason why Japan is the only country in the world with so many different kinds of restaurants that are devoted to one “thing” only. Go to a yakitori house in Tokyo, and you’ll get grilled chicken all right—perhaps twenty different types of grilled chicken on skewers are on offer, so that you can spend hours digging deeper and deeper into the essence of chicken. You finish the evening understanding chicken so well, from the inside out, that you feel as if you’re about to lay an egg.